The Andromeda galaxy was photographed by André van der Hoeven. A huge meeting of space scientists kicks off this week in Seattle, Washington, as thousands of attendees descend on the coastal city. The winter 2015 meeting of the American Astronomical Society will play host to 2,600 scientists, journalists and educators this year, according to a press kit released by AAS. Space.com reporters will be on-site covering the news coming from the large gathering of planetary scientists, astronomers and other space researchers sometimes dubbed the "Super Bowl of Astronomy." "This 225th AAS meeting will feature more than 1,900 scientific presentations, including prize and invited lectures, short oral talks, and posters," AAS representatives wrote in the press kit. Scientists will present finding about new alien planet findings, far away galaxies and other new space discoveries throughout the conference, which runs from Jan. 4 to Jan. 8. Officials from NASA, the National Science Foundation and other space organizations will host town hall meetings throughout the conference to discuss funding and science outlooks in the coming year. Attendees will also give special presentations about everything from astronomy throughout history to the legacy of the Hubble Space Telescope, which will be in space for 25 years in 2015. "The Seattle meeting offers no fewer than 17 prize and invited talks by distinguished astronomers, beginning with the Kavli Lecture by Daniel Baker (University of Colorado, Boulder) on the Earth-girdling Van Allen radiation belts and ending with the Berkeley Prize Lecture by David Weinberg (Ohio State University) on the Sloan Digital Sky Survey's contributions to astrophysics," AAS representatives added. The winter meeting of the AAS is usually the first of two AAS meetings per year; however, this year will be different. The International Astronomical Union is hosting its general assembly in August in Hawaii, therefore, AAS will combine with the general assembly in lieu of a summer meeting. The last AAS meeting was held in Boston, Massachusetts in June 2014. Interested people unable to attend the conference in person can participate in and follow the conference online by using the hashtag #aas225 on social media. Space.com staff writers Miriam Kramer (@mirikramer) and Calla Cofield (@callacofield) will be in Seattle covering the conference. Find out more about the astronomy conference directly from the AAS: http://aas.org/meetings/aas225. 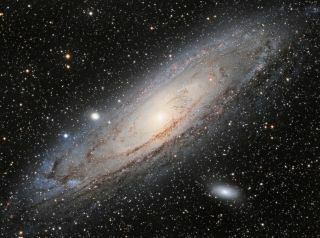 Visit Space.com daily this week for the latest news from the American Astronomical Society meeting.